First Niagara CEO Gary Crosby addresses shareholders at its annual meeting Wednesday. 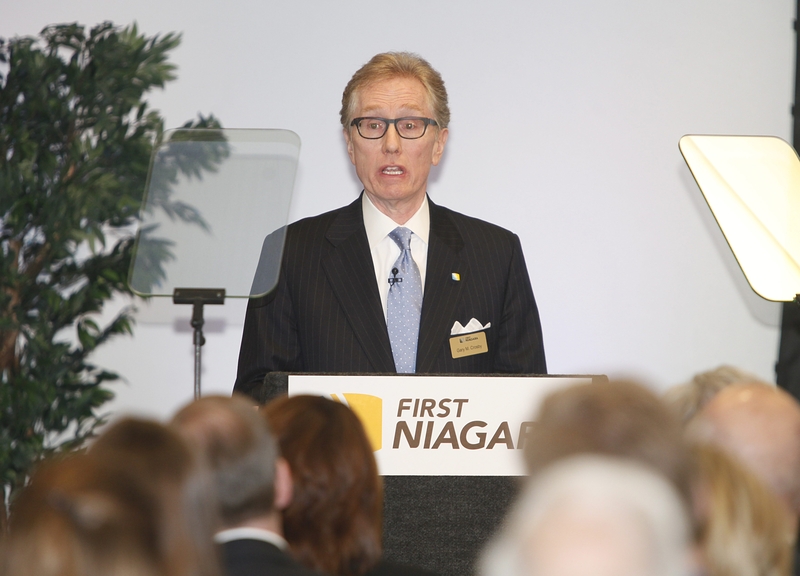 First Niagara Financial Group leaders Wednesday urged shareholders to be patient with the investments the bank is making in its operations, saying the spending is critical to the bank’s long-term success. “We are making these investments now because we want to be in the best possible position to take full advantage of a healthy economy and an improved interest rate environment,” said Gary M. Crosby, the bank’s president and CEO, at the annual shareholders meeting in Buffalo. First Niagara has been under investor pressure to get more out of the various acquisitions it made in recent years that dramatically expanded the size and reach of the bank. The stock price, which closed at $8.92 per share Wednesday, has not closed above $10 per share since Jan. 23, after the bank announced the investments. This was Crosby’s first annual meeting as the bank’s permanent CEO. A year ago, he addressed the shareholders as interim CEO, following the removal of John R. Koelmel from the position. First Niagara employs about 5,800 people, including about 2,200 in Western New York, and is headquartered in Larkinville. First Niagara has about $37 billion in assets and recorded net income of $295 million on revenues of $1.5 billion last year. During the portion of the meeting set aside for shareholders’ questions, shareholder Peter Ninos, of the Town of Tonawanda, criticized the bank for not restoring the stock dividend at a time when its top executives are receiving high pay packages. “The stockholders, all we hear is, we’re building for the future,” Ninos said. “Well, for me the future is now. I would like to see the dividend returned to what it was before we got so big.” The bank cut its dividend from 16 cents per share to 8 cents in December 2011. Bowers also said top executives at the bank, as well as members of the board of directors, are also shareholders. “We’re all in this together, we all want to see an improved share price,” he said. Another shareholder asked whether First Niagara is incurring high regulatory and compliance costs akin to M&T Bank’s. Crosby recalled that when he joined the bank about 4ø years ago, the bank had about 15 people focused on regulatory compliance. Today, that number is more than 170, he said. In comments after the meeting, Crosby said he did not expect First Niagara to close more branches this year, beyond the 10 closings announced earlier in the year. Nathaniel Woodson was elected the new chairman. He joined the board in 2011, after First Niagara completed its acquisition of Connecticut-based NewAlliance Bancshares. Woodson had been a member of NewAlliance’s board prior to the deal.